For Christmas, Harry Lowe gave me a lovely glass hummingbird feeder. We are both unusually fond of our hummingbirds. Unable to find a suitable feeder and with hummingbirds looming, last year I did the unthinkable. I bought a cheap plastic model to stave off their hunger. Clearly, Harry Lowe would rather they fly by than to indulged from my pedestrian feeder. 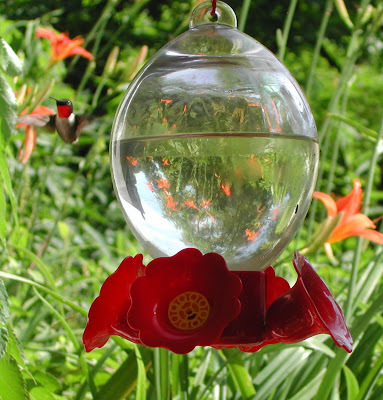 Luckily for my fashionable hummingbirds, he replaced it with a substantially large, hand-blown feeder. This season, I hadn't seen a single hummingbird and worried that, like Harry Lowe, they could simply not bring themselves to stop by if forced to partake from that styleless feeder. They returned this morning, looking for any port in the storm. One lone, hungry hummingbird was out search for the feeder. I quickly brewed some syrup and the new feeder was hung.